No matter where you are, the area around you is perfect inspiration for creating a monologue. All you will need is your five senses, something to write with, and a piece of paper for this exercise to lead you to building dynamic characters with rich monologues. You can also download a one-page printable PDF of this exercise! Take in the room around you. Look around, listen, and observe. 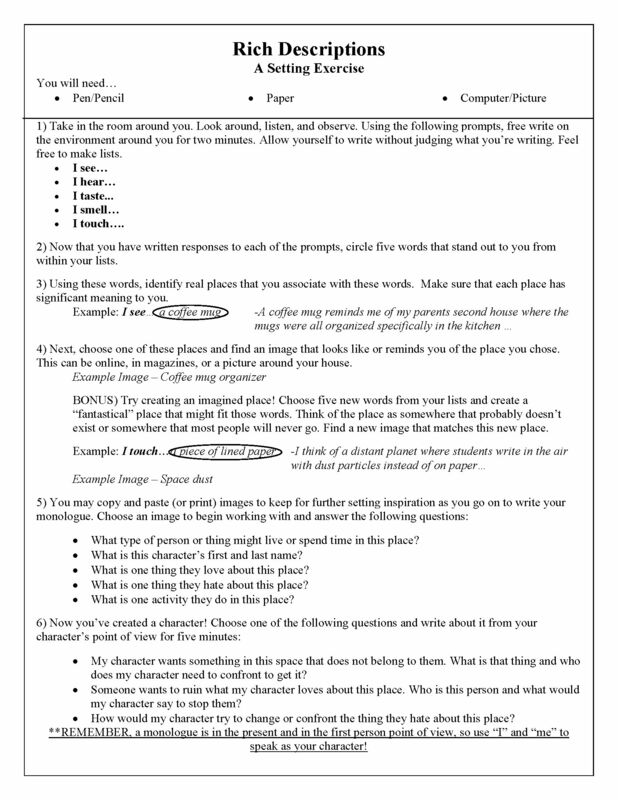 Using the following prompts, free write on the environment around you for two minutes. Allow yourself to write without judging what you’re writing. Feel free to make lists. Now that you have written responses to each of the prompts, circle five words that stand out to you from within your lists. For this step, choose one of these options. 1) Using these five words, identify real places that you associate with these words. Make sure that each place has significant meaning to you. Example: I see… a coffee mug (A coffee mug reminds me of my parents second house where the mugs were all organized specifically in the kitchen). 2) Create an imagined place. Create a “fantastical” place that might fit these five words. Think of the place as somewhere that probably doesn’t exist or somewhere that most people will never go. Find a new image that matches this new place. Next, choose one of these places and find an image that looks like or reminds you of the place you chose. This can be online, in magazines, or a picture around your house. You may copy and paste (or print) images to keep for further setting inspiration as you go on to write your monologue. What type of person or thing might live or spend time in this place? What is this character’s first and last name? What is one thing they love about this place? What is one thing they hate about this place? What is one activity they do in this place? My character wants something in this space that does not belong to them. What is that thing and who does my character need to confront to get it? Someone wants to ruin what my character loves about this place. Who is this person and what would my character say to stop them? How would my character try to change or confront the thing they hate about this place? *REMEMBER, a monologue is in the present and in the first person point of view, so use “I” and “me” to speak as your character!